Amid global climate change talks, Virginia cities surge ahead on action. Leaders in communities off the coast of Virginia are not debating whether climate change is real. The area of Virginia known as Hampton Roads has already been experiencing some of the worst conditions on the East Coast attributed to climate change, as rising sea levels contribute to worsening flooding and struggling infrastructure. Residents experience frequent "nuisance flooding" that covers roads, including in some cases the only way in and out of military bases. In Norfolk it's no longer unusual to see fish as roadkill, according to Skip Stiles, the executive director of an environmental nonprofit called Wetlands Watch. 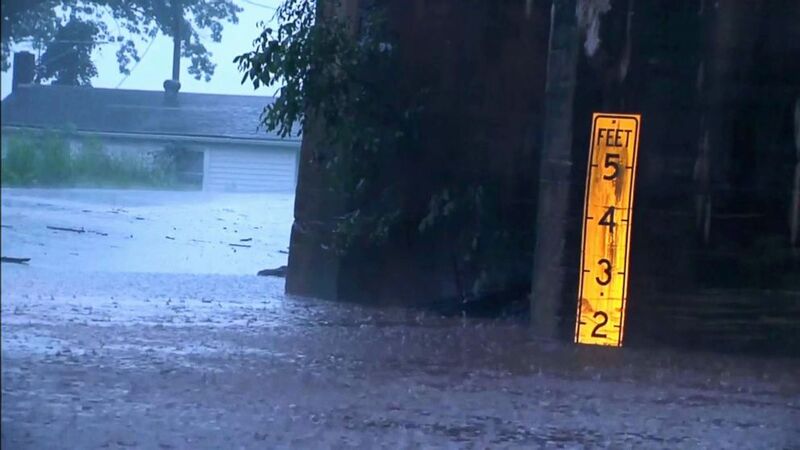 (WCAV) A marker shows deep water after flash flooding swamped roads in Virginia, May 30, 2018. Stiles said that after 12 years in coastal Virginia he's seen the inescapable evidence of climate change. He said residents have noticed frequent flooding too and are pressuring local officials to do something about it, saying "when people get wet and angry they don't go to the state capitol or Washington." "If you go to any gathering to 10 people and ask who's had to change their route to work or school in the last two months because of flooding a few hands always go up," he said in an interview. Local experts and officials said they were not surprised that the latest federal report on climate change predicts even worse flooding because they're already experiencing and working to do something about it. While the Trump administration attempts to poke holes in the latest federal report on the potential worsening impacts of climate change, the findings are not a surprise to officials in Virginia who have been working for years to respond to worsening flooding. This week, leaders from 195 countries which signed on to the Paris Agreement to limit the scope of climate change are meeting to discuss the latest scientific reports and progress toward their goals. The Trump administration does have a delegation at the talks but still plans to pull out of the Paris Agreement, saying the president wants to negotiate a "better deal" for U.S. interests. "The politics surrounding the new report is something that we had discussions and issues such as that 10 years ago when we were having these conversations about whether this was happening," Ben McFarlane, senior regional planner for the Hampton Roads Planning District Commission told ABC News. President Donald Trump and other administration officials have sought to downplay the report, alleging that it focuses only on the most extreme predictive models or uses unreliable assumptions. But McFarlane and other experts in Virginia said they don't need predictive models to know that sea levels are rising and flooding has gotten worse in their area. Residents already experience more days of flooding every year due to outdated stormwater systems, gradually sinking land, and consequences of climate change like rising sea levels and more intense rain events. (Matt McClain/The Washington Post via Getty Images) A pedestrian walks on a sidewalk after morning tidal flooding in Alexandria, Va., Sept. 10, 2018. 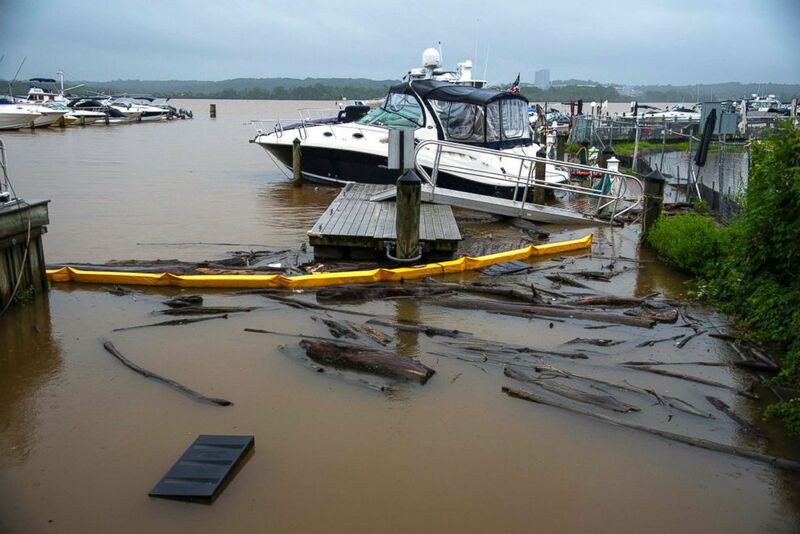 Molly Mitchell, a researcher with the Virginia Institute of Marine Science, said most of the discussion about how to respond to that flooding relies on observations recorded through a network of sensors along the coast. "Sea level has come up more than a foot since we started reporting this at the beginning of the century about the 1930s, and its predicted to come up about a foot and a half to two feet by 2050," she told ABC News, adding that sea level rise is expected to rise much faster in the future. The new national climate report, released last week, says that flooding during high tide now poses daily risks to businesses in Virginia and other coastal states. 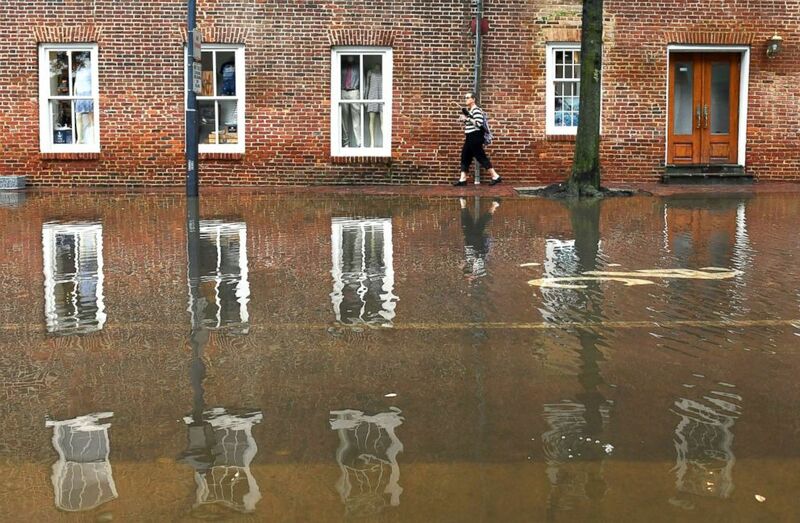 In the Hampton Roads area, which includes Norfolk and Virginia Beach, flooding can hamper access to some of the largest Naval bases in the country. Multiple authors that worked on the infrastructure section of the National Climate Assessment released last week said the local officials they work with regularly are less concerned with debating the validity of climate change reports and more focused on local projects that will protect their community from the impacts of climate change. "From where I sit and what I see in the communities and the states the train's already left the station. People know they need to this information, they're seeking it out and using it to make their communities stronger and more resilient," Jennifer Jacob, an engineering professor at the University of New Hampshire and one of the lead authors of the report, told ABC News. Officials in Virginia have been working for years to decide how they will plan for a future where sea levels and temperatures continue to rise, leading to more risks from the water that rises with every tide or storm. Cities along the coast are already setting new building codes that require homes to be elevated, encouraging residents to buy flood insurance and planning for what the future of their cities will look like. "As a region right now we're in the process of spending billions of dollars in highway improvements, bridges and tunnels. Those projects, assuming they're maintained properly, are meant to last for 100, 150 years," McFarland said. And it's not just a matter of replacing roads, bridges, or water infrastructure. The standard approach to engineering doesn't account for such a drastically changing climate, so city planners have to figure out what is needed to protect homes and businesses from potentially unknown conditions. In Virginia Beach, the city council even denied a proposal to build 32 homes in a subdivision vulnerable to flooding, according to the Virginian Pilot, which has prompted a lawsuit from the developer who says they applied with all requirements to plan the project. Stiles said that even as local governments work to dig themselves out of the status quo as the climate changes, federal policies that allow infrastructure projects to go forward without considering climate impacts are just digging the hole deeper. "Every federal policy is still aligned with the 1950s," he said. "Want to build a highway with federal funding along the coast? You don't need to look at future flooding, here's your money." (Calla Kessler/The Washington Post via Getty Images) A dock at the City Marina in Alexandria, Va., floods after days of raining, July 24, 2018. Another obstacle for communities who want to make their cities more resilient to climate change is cost. Officials say they can't afford billions of dollars of work without more national resources and funding. "Right now there is not sufficient local funding to do all of the improvements that are identified or are foreseen to deal with sea level rise. Where that additional funding comes from, we think that federal resources are necessary, we think that we are a worthwhile expenditure on the federal side," he told ABC News. The new Congress could play a role as it decides how to appropriate money in the next federal budget. The Hampton Roads area could benefit from a program to improve infrastructure around military installations that was created in a bill passed earlier this year, but Congress would have to assign money specifically for that program which, so far, it hasn't done. Jacobs said the impact of climate change on roads and other infrastructure is being handled at the local level but a national issue and the federal government needs to focus on helping all those communities handle rising sea levels, not just cities. "If you sit in Charleston or Hampton Roads, Virginia you know there's a problem. However, most of those communities are trying to handle the problem on their own. This is a national issue. The I-95 corridor has huge economic value from a federal level," Jacob said. "The process rarely moves along smoothly. I think that congress members, senators, they all want to take care of their states and their communities and if they're hearing from their constituents that they've got a problem, that's certainly a pathway that resonates with them." The new federal climate report discussed the impact of climate change on infrastructure, which President Donald Trump has touted as a priority under his administration. The report said that our countries transportation systems are at risk from more flooding, wildfires, and extreme weather and that our energy infrastructure may not be able to keep up with increased demand for electricity during extreme heat.